Has your business been burned by group buying? When the social-based marketing scheme broke out over a couple of years ago, group buying created a lot of buzz. But the trend also resulted in some businesses going bust or deals going bad. A Toronto-based startup named Sitomic, aims to help companies limit group buying risks by offering a coupon-sharing sharing service that doesn’t skim off the top of a business’ profits. “This is a totally different take on the group buying trend,” says Dmitri Sennikov, the head of business development for Sitomic. Sennikov and partners Anna Rusetskaya, creative director, and her sister Sasha (user experience developer and designer), started the business in September last year and came out with their first product in February. Sitomic now has about 500 users mostly based in Canada, but the service is being offered worldwide. Sitomic is primarily a mobile marketing online platform that provides tools for businesses to create professional mobile landing pages, send out SMS marketing messages and launch QR code-based marketing campaigns to mobile phone users. Much like other group buying sites, Sitomic helps companies generate businesses by providing a site where customers can get discount coupons for goods and services. But instead of having businesses offer massive discounts indiscriminately, Sennikov said, Sitomic enables businesses to reward with additional discounts for “loyal customers” who spread the world about the business to their friends. 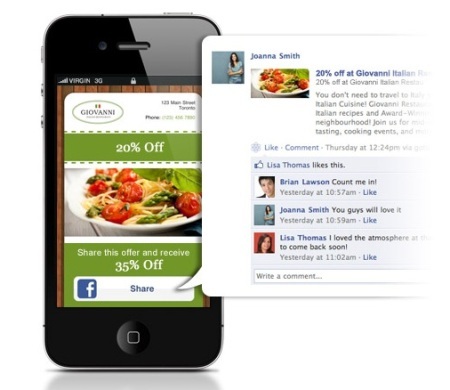 Sitomic helps clients create a social coupon offering whatever discount the client wants. This coupon can be distributed through SMS text messages, mobile ads or QR-code enabled print ads. Consumers can use the face value of the coupon or, using Sitomic’s social media interface share it with their Facebook friends in order to get an even larger discount. “We increase the reach of our client’s campaign by enticing consumers to share the deal with their friends,” said Sennikov. With group buying sites, businesses attract customers with massive discounts. Often businesses experience a huge surge of demand when they initiate a group buying campaign. But there are some downsides to this awesome response. For one, the businesses are offering goods and services at discounts of at least 50 per cent off, so they are taking a huge cut in profits. Group buying campaigns also tend to attract mainly bargain hunters who often don’t come back after the offer is gone. Another disadvantage is that many group buying services also take a cut from the profits made by shops thereby slicing further what maybe an already small earning. Of course group buyung can be a boon for many businesses. For example, Kathryn Ashby, proprietor of fine dining Quebecois restaurant Café du Lac says the group buying site Groupon did wonders for grabbing attention to her obscure restaurant which is located in a quite stretch of Lakeshore Boulevard just outside downtown Toronto. “Summer is a typically slow period for us. I thought the campaign would sell 200 coupons for its entire duration. We actually sold 200 coupons for the first two hours of the campaign,” she said. “The campaign brought attention to us from people in the city and even outside Toronto. Quite a few have become repeat customers, she said. But there are also group buying horror stories like that of Jessie Burke, owner if Posies Café in Portland, Ore.
Burke wrote in a revealing blog post how her café ended up losing more than $8,000 from its Groupon promo. Her business was inundated by overwhelming traffic and more than a few rude customers. To top it off, she was selling at prices that barely covered the cost of the food being served. Sitomic differs from other social couponing sites in a number of ways. For one thing, it doesn’t compel businesses offer profit-eating discounts to just about anyone. Clients can decide how low or high the discounts are. The come on for customers is that they get a bigger discount if they share the news about the offer to their Facebook friends. Sitomic also does not take a cut from its client’s profits. The company charges a set price depending on the size of the campaign. Their basic package goes for $24/month. This covers up to 2,500 unique visitors per month to the site which will be created by Sitomic for the client. A pricier package which includes the same services but covers 10,000 site visits per month can be had for $77/month. The top of the line package covers 50,000 unique visits per month and costs $245/month. Sennikov said the basic package is aimed at small businesses and professionals offering services while the larger packages are geared towards larger companies. Recently, Sitomic also began offering of value added reseller programs while enable VAR clients to white label Sitomic and offer the service to their own customers.